At the same time, we continue to ask for more because the time to stand with immigrant New Yorkers is now. We know that aggressive immigration policies will continue to affect our students’ ability to learn, so we are asking the DOE to do its part to advocate for children and families both inside and beyond the classroom doors. Train and provide an immigrant liaison in every school. 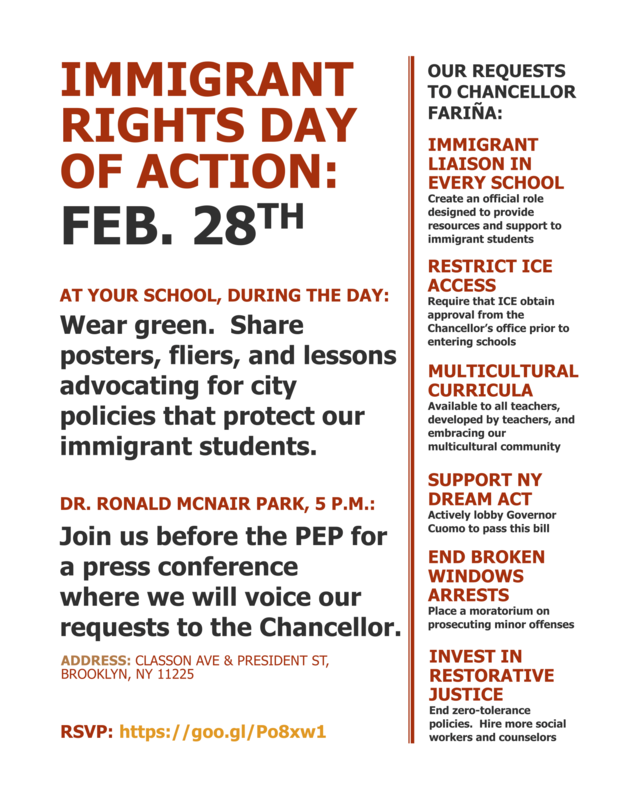 We ask the Chancellor and DOE to expand on the initial letter by publicizing an explicit, transparent protocol for all of NYC schools that includes no ICE agents granted entry at schools unless they have received permission from the Chancellor. Fully develop the Department’s recently created web-page to support immigrant students so that schools can connect families with the information and resources they need during this important time. Collect and distribute teacher-developed tools and curriculum that embrace our values as a multicultural and multilingual community. Direct the NYPD to stop making broken windows arrests and for the five District Attorneys put a moratorium on broken windows prosecutions, as outlined in the #NYCdontprosecute campaign.